*We currently are not growing this item, but feel free to peruse the information. June is a medium sized hosta. It has a wide dark blue-green margin with a chartreuse center and blooms in midsummer with lavender bell-shaped flowers. 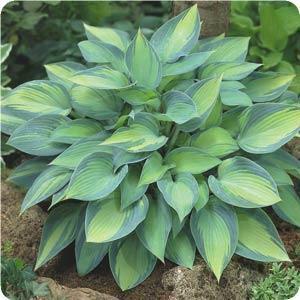 Hostas are extremely popular, hardy herbaceous perennials grown primarily for their beautiful foliage. They are easy to grow, shade-tolerant plants. The plants are low maintenance. Hostas originally came from Japan, China, and Korea. They were first introduced to Europe in the late 1700s and then came to the United States in the middle 1800s. Spacing: Plant 36″ to 48″ apart. Height: Grows 12″ to 16″ tall. How To Grow: Plant in part to full shade. Outstanding Features: The June Hosta was the 2001 Hosta of the Year. Tips: Likes rich, moist, well-drained soil.